This certainly made me smile with its funky posture. It would fit where I want my mitten storage unit to be but would still have the problem of exposed cluttered. And the color - oh so popular now but just doesn't fit in my house. I don't redecorate each time the color scheme changes. That often makes it a challenge to find matches. 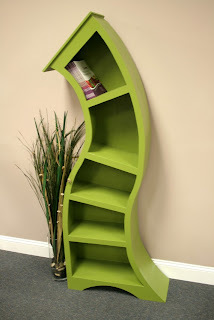 I found this funky, fun bookcase by Scott Blackwell over on Etsy.